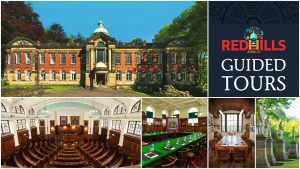 Explore the history and meaning of Redhills with a guided tour of the home of the Durham Miners’ Association. The programme of guided tours is the first in the 103-year history of Redhills, which was recently selected by Historic England as one of the country’s 100 Irreplaceable places. With the help of expert guides, visitors will be able to explore The Pitman’s Parliament, where elected delegates from each of Durham’s collieries met for generations. The tour will also include the rooms and corridors of Redhills which serve as a living archive of labour movement history and culture. The guided tours, offered in partnership with mining and labour heritage organisation Education 4 Action (E4A), last 90 minutes. Places are limited to 15 per tour and people are advised to book early to secure their places. A standard ticket costs £5, with unwaged priced at £3. A solidarity ticket is £10 for those able to contribute more, helping us offer lower priced tickets. All tickets include a Redhills booklet worth £2 and proceeds will go to The Redhills Appeal – the DMA campaign to renew the Miners Hall as a centre of education, heritage, and culture. DMA Programme Director Ross Forbes said: “Redhills is a unique and extraordinary place. It moves and inspires people who visit, and we are delighted to be able to open our doors to the public with these guided tours. Give your support to The Redhills Appeal here.